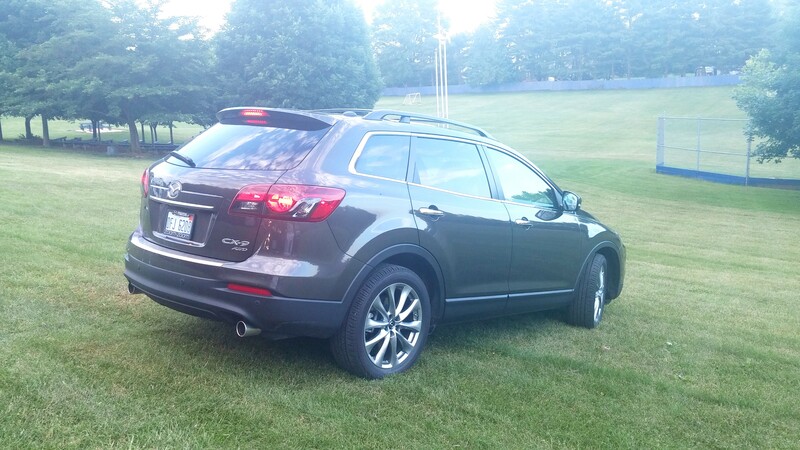 I had the opportunity to drive a 2015 Mazda CX-9 Grand Touring AWD for a week recently. No compensation was received. All thoughts and opinions are my own. Many thanks to Mazda for loaning me the car! Snapshots of the car are from my phone. Professional images are courtesy of Mazda. It’s not often that I get to test drive a car that would actually fit my family of seven, but the 2015 Mazda CX-9 can. Easily and comfortably. With 7 seat belts (two in the front and back, three in the middle), everyone in my family had a comfortable place to sit. 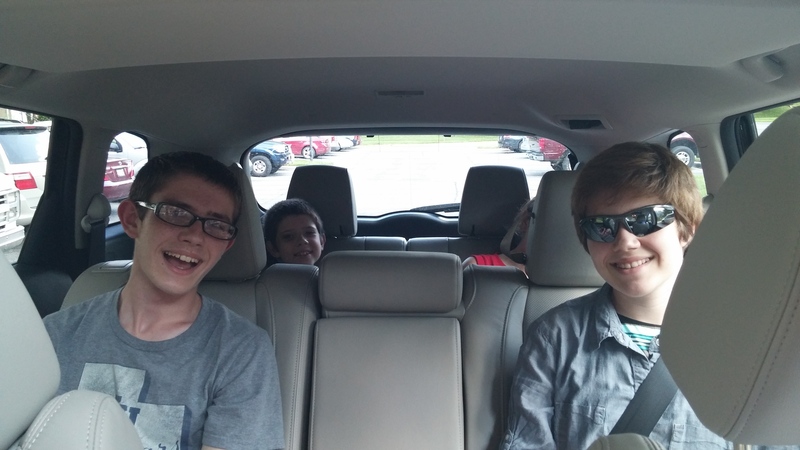 This year, I actually had one less family member to fit in the car, since my oldest daughter is at college, so the kids were even more comfortable just using 4 of the 5 rear seats. For the kids to be comfortable and complaint-free in the car is a big deal. 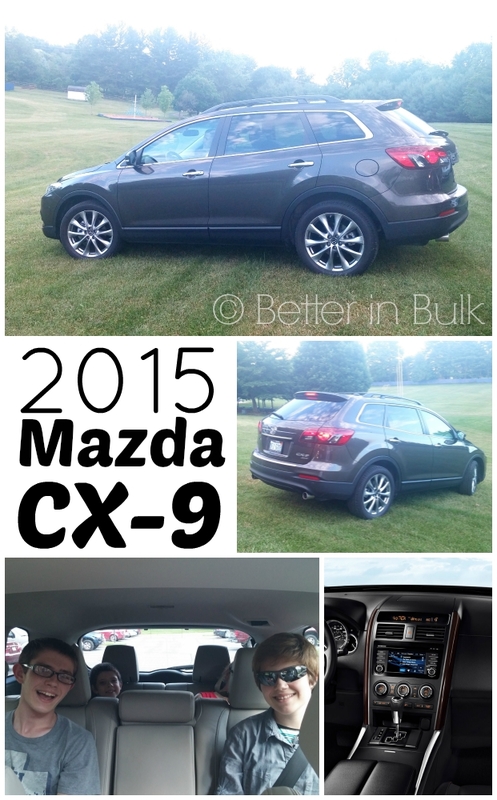 The kids LOVED the Mazda CX-9! I was actually impressed with the amount of cargo space in the back. Typically, I find that SUVs are very lacking in the storage department when the back row of seats is being used, but the CX-9 wasn’t bad at all. And best of all, it didn’t feel like I was driving around a tank. I love finding cars that feel bigger on the inside – and the CX-9 certainly fits the bill. The more I drive Mazdas, the more I fall in love with them. As I’ve said many times before, I am not a car expert. I was raised by one, and know enough about cars to form an objective opinion about them. I have always been more concerned about drivability and comfort than specific specs. I drove a 2013 Mazda CX-9 2 years ago, and I had to check back to see what I thought about the older model. One of my complaints – that I felt boxed in when in the driver’s seat because of the middle console – wasn’t an issue with the 2015 model. Although the design was similar between the two cars, the console didn’t phase me this time. In fact, I really enjoyed driving the CX-9 and felt completely comfortable in it. Because I couldn’t hop back and forth between the two models, I’m not sure what changed – the design of the car or my “pickiness.” Either way, I had no complaints this time around. The 2015 Mazda CX-9 is available in three trims: CX-9 SPORT starting at $29,985 MSRP, CX-9 TOURING starting at $32,480 MSRP, and the CX-9 GRAND TOURING starting at $35,035 MSRP. ENGINE AND DRIVE TRAIN: I drove a 2015 Mazda CX-9 Grand Touring AWD, but the CX-9 comes in either standard Front-wheel drive (FWD) or available Active Torque Split All-wheel drive (AWD) with a 273-hp engine, 3.7L DOHC 24-valve V6 with 6-speed Sport automatic transmission. EPA-ESTIMATED FUEL EFFICIENCY: How much will it cost to drive the 2015 Mazda CX-9? FWD models have an estimated 17/24 MPG and AWD models have an estimated 16/22 MPG. AVAILABLE FEATURES: Bi-Xenon High-Intensity-Discharge (HID) headlights with auto on/off, Power sliding-glass moonroof with one-touch-open feature and interior sunshade, Power rear liftgate, Mazda Advanced Keyless Entry & Start System, Heated front seats, Power driver’s seat, Driver’s seat memory, Navigation system, Bose® Centerpoint® Surround Sound System with AudioPilot®, Pandora internet radio connectivity. SAFETY FEATURES: Standard advanced front air bags, front side-impact air bags, side-impact air curtains, Dynamic Stability Control (DSC) and Roll Stability Control (RSC). Available Rearview backup camera, Rear parking sensors, Blind Spot Monitoring System and Rear Cross-traffic Alert. Have you driven a Mazda CX-9? What were your thoughts?